The adidas EQT Support Ultra Boost is part of the adidas EQT “Turbo Red” Collection that will be debuting on the 26th of January. 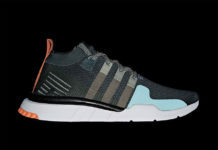 This adidas EQT release reunite the EQT Support’s original mesh and nubuck construction with a modern Ultra Boost tooling. Classic Equipment elements are restored in full, including the webbed Three Stripes lacing system and asymmetric tongue. This release comes dressed in a clean Black and White color scheme with its new signature Turbo Red. Look for the adidas EQT Support Ultra Boost “Turbo Red” to debut on January 26th, 2017 at select adidas Originals retailers, including Overkill and adidas.com.